This lovely vessel was factory-equipped with Furuno NavNet3D, but the current owner desired updated electronics and new open-array solid-state radar. 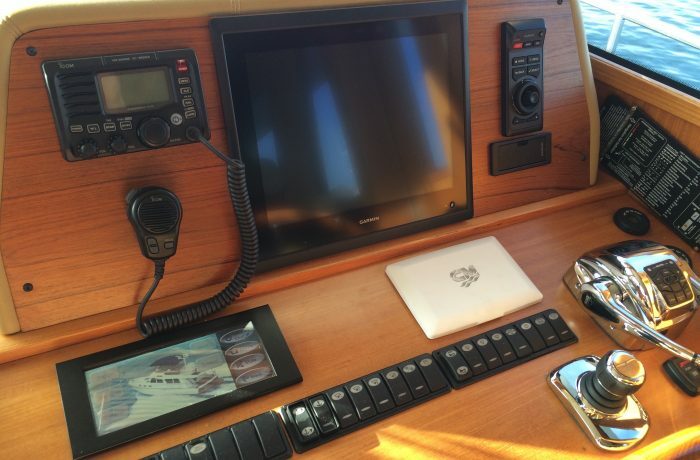 As they were familiar with Garmin from previous vessels, we designed a Garmin 8500-series blackbox system with multi-touch monitors and Garmin GRID keypads for multi-mode operation. A custom teak dash panel was required and built to fit the large format monitor and associated electronics. With a blackbox display at both the main helm and in the flybridge, an open-arm radar, and exclusive auto-guidance route-building functionality, the customer was ready for extended cruising in all conditions.